Jeff Moody from Stripwax waxes poetic about Hurry Up Victory Hamilton at Vitus. Oakland, you lucky bastards. On the night of June 22nd, a Friday night, three of yer best rock (and roll) bands will join together for a super-trifecta of sonic awesomeness at Vitus. Discard whatever petty, menial plans you may have made for that evening because, unless you are strapped to a hospital bed in some aseptic-smelling psyche ward, incarcerated, or declared dead before 10pm that night, you will face a lifetime of regret and all of it’s consequent, bone-aching misery if you miss this show. Why? I’M GLAD YOU ASKED. I’ve never actually watched any of these bands perform because I live in a far away land called Wisconsin. I have, however, heard their studio recordings, and all three have made records that are near the very top of everything I’ve heard in the past 10 months. In other words, Oakland, yer town is in a unique position. Everyone says “rock is dead”, and from a surface-level view, (the radio, Pitchfork, etc.) 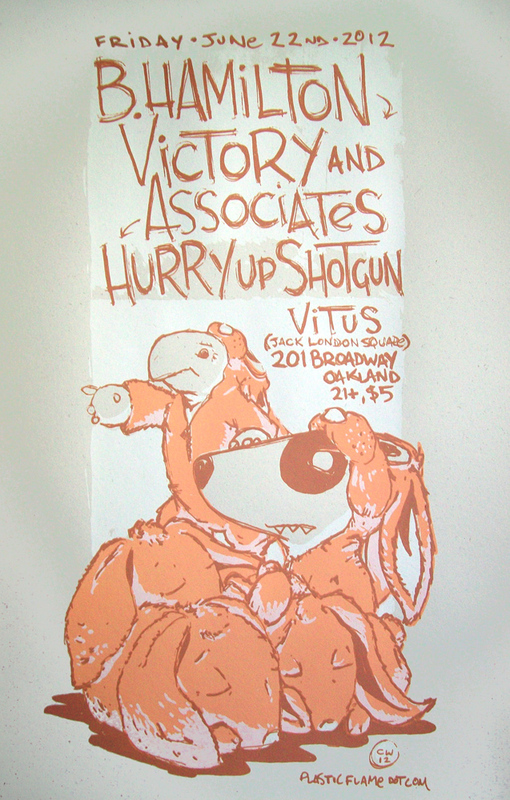 there isn’t much evidence to the contrary, but you Oakland, you have Hurry Up Shotgun, Victory And Associates, and B. Hamilton, and on the evening of June 22nd, Vitus will be the hypocenter of a potential rock revolution, and you’ll want to be able to say you were there to not only witness it, but to help make it happen. You still have time between then and now to prepare to play yer role in the future of rock history, and you can start by picking up their recent, world-beating records on Bandcamp. This record positively shimmers with brilliant guitar arrangements and vocal harmonies that fly high up into the troposphere. If lead vocalist/guitarist Austin Pitts has the live vocal chops to recreate what he did in the studio with the impossibly perfect “Watermelon Sugar” (inspired by Richard Gary Brautigan’s 1968 novella “In Watermelon Sugar”) then he is without a doubt one of the most talented rock singers around in 2012. For real. Buoyed by the endless positivity generated by bandleader Conan Neutron, Victory And Associates typically play fast, tight and sharp compositions that, to my estimation, come from somewhere in the space between The Buzzcocks and The Dead Kennedys. I have zero doubt that this band will raise the Vitus room temperature at least ten degrees by the end of their set. Jesus, listening to this record is like looking at the Grand Canyon, really… it takes several listens to fully absorb it. “Everything I Own Is Broken” is vast and complex, yet gentle and comforting and wise in ways that I’ve already blown over a thousand trying to explain. Halfway through 2012, this brilliant collection of songs is amongst my top three favorites of the year thus far. Now you have no excuses, Oakland. Go make rock history. Posted in Press | Comments Off on Jeff Moody from Stripwax waxes poetic about Hurry Up Victory Hamilton at Vitus. They will be available at the show… you do *NOT* want to miss this one people.